Searchable digital images of listings from a 1930 business directory for the town of Brazil. This database was contributed by Wayne Klusman. Searchable digital images of listings from a 1930 business directory for the city of Crawfordsville. This database was contributed by Wayne Klusman. Searchable digital images of listings from a 1930 business directory for the city of Wabash. This database was contributed by Wayne Klusman. An index of 352 students in grades 1 through 12, as listed in Dale High School's 1949 yearbook, Maple Leaves. Browsable digital images of students in grades 9 through 12, as listed in Garfield High School's 1953 yearbook, Benedictus. Browsable digital images of teachers in grades 9 through 12, as listed in Garfield High School's 1953 yearbook, Benedictus. An index of 51 students and the degrees they received, as listed in a 1927 commencement program. NOTE: Evansville College was later renamed the University of Evansville. An index of 1,182 students, their majors and the degrees they received, as listed in a 1975 commencement program. NOTE: Indiana University-Purdue University Fort Wayne opened in 1964, the result of the merger of the Fort Wayne campuses of Indiana University and Purdue University. 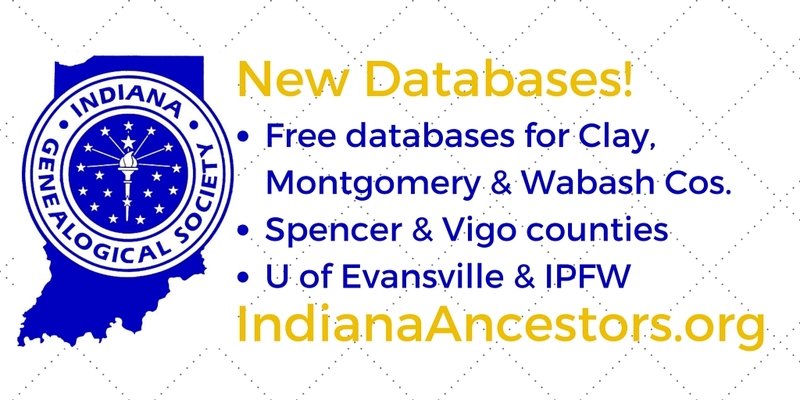 Civil War rosters, state prisoners, schools, and a county history -- all new on the Indiana Genealogical Society website! Browsable digital images of listings from a 1930 business directory for the town of New Castle. This database was contributed by Wayne Klusman. Broweable digital images of listings of the soldiers in each company, as listed in an 1882 history of the regiment. This database was contributed by Barbara Westfall. Browseable digital images of a listing of alumni who had graduated in 1939, as listed in Nappanee High School's 1940 yearbook, Napanet 1940. This listing includes their location and their occupation. Browsable digital images of students in grades 9 through 12, as listed in Alva Neal High School's 1938 yearbook, The 1938 Kite. Browsable digital images of teachers in grades 9 through 12, as listed in Alva Neal High School's 1938 yearbook, The 1938 Kite. 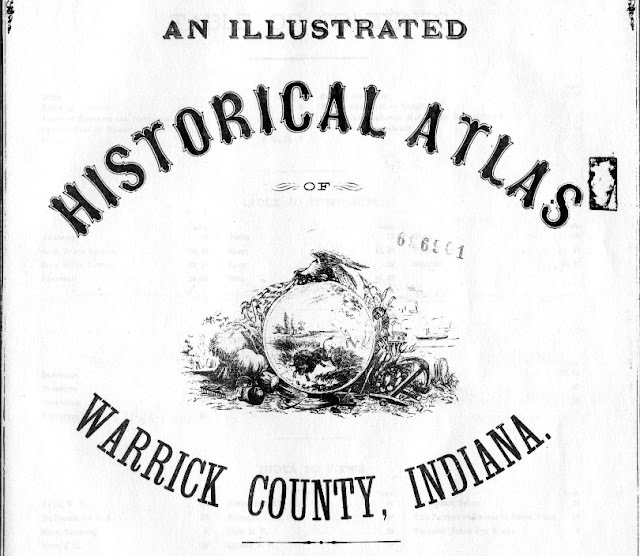 Browsable digital images detailing the history of the county from its formation, as listed in an 1880 atlas of the county. Browsable digital images of a listing of some residents, as listed in an 1880 atlas of the county. This listing includes their occupation, birthplace, and the year they settled in the county. An index of 400 prisoners who died at the state prison in Jeffersonville, as listed in the institution's annual reports. The listing includes their date of death and cause of death (if known). NOTE: From 1822 through 1858, Jeffersonville was the only state prison; beginning in 1858, it only housed prisoners from the southern half of the state. It closed in 1897. I am wondering if there are any materials available that might have pictures or lists of employees of the farm machine manufacturer Rumeley Co. near Laporte. In 1931 Allis-Chalmers bought Rumeley. I believe that my grandparents both worked there. They may also have met there. Also, I suspect that my grandfather, Earl L. Downing, lost three fingers in a workplace accident at Rumeley. All suggestions will be greatly appreciated. Thank you. In the 1840 Indiana Census my relatives were in Grant County, Indiana. Charles Maudlin ( Modlin) and his wife Mary Holt Maudlin are found in that census. I believe that they lived in the area until their deaths that may be around 1850. I am trying to establish that Charles is my ancestor; that their sons were Jesse Holt and Nathan Maudlin ( who is my confirmed ancestor). Jesse is found in 1840 in Randolph County and in 1850 in Miami County, then Jesse takes his family to Iowa. Note: I don't need any thing for Jesse or Nathan. Nathan died in the Civil War, and he lived in Howard County, where I was born. What I need is more on Charles and Mary, if it exists. Let me know who to contact, if this is the wrong place. Thanks. Trying to locate baptism records from St. Peter’s Lutheran Church in Franklin Township, Harrison County; Years 1830-1856. Is this Church still around? Can you tell me who I should contact for Information.